Don't see what you are looking for in a stock pallet jack? 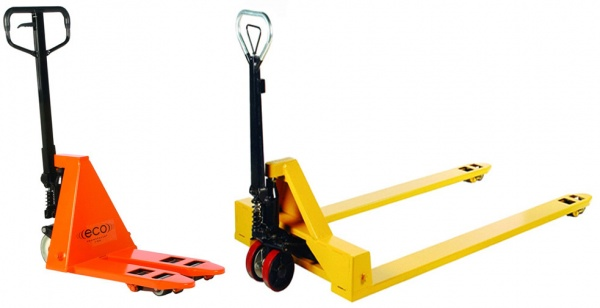 Maybe a Custom Designed Pallet Jack is what you need. Are all Pallet Jacks created equal? No. Everyone's operations and applications are different, and sometimes a standard, in stock pallet jack may not fit the bill. That’s when we need to take a look at your requirements and determine whether we are able to revise an existing pallet jack or custom design one to meet the needs of your unique requirements. Please bear in mind that the average cost of a custom designed pallet jack starts at $1,000 and has a 3 to 5 week delivery. Polyurethane Wheels and Rollers: For “normal warehouse conditions,” best suited for concrete floors free of small obstructions. Versatile enough to suit most applications, they provides soft, quiet operation. Non-marking poly material is ideal for tile floors, and they are easy to maneuver under maximum capacities. Nylon Wheels and Rollers: Offer an optimum combination of high capacity, impact resistance and low rolling-resistance. Efficient for clean room and less than desirable warehouse conditions, such as wet, unheated, and chemical exposed environments. Steel Wheels and Rollers: Offer maximum performance under high load capacities. The smooth, flat machined surface allows minimal rolling resistance without damage to floors. Steel wheels are ideal for resistance to extreme elements and chemical environment applications. Rubber Wheels: Provide smooth, shock absorbing performance. These are ideal for all-weather, rough terrain, and electrical environments.